The firm says its oil and gas reserves will not lose value as the world adapts to rising temperatures. However, Exxon does not dispute that global warming is happening. Exxon's report was in response to a call from activist shareholders. It is the first detailed report by a major oil and gas company about the potential impact of climate change on future business prospects. Exxon shareholders As You Sow and Arjuna Capital had demanded to know what impact climate change, and subsequent global policies to slow its impact, could have on Exxon's assets and future profitability. In their appeal, they had cited reports that there would be lower demand or prices for fossil fuels in the future as a result of climate change or greater global carbon regulations. "We believe producing these assets is essential to meeting growing energy demand worldwide, and in preventing consumers - especially those in the least developed and most vulnerable economies - from themselves becoming stranded in the global pursuit of higher living standards and greater economic opportunity," Exxon said in the report. 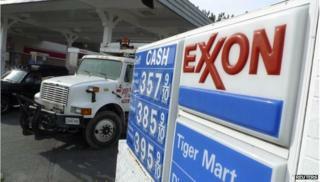 Exxon said that it expected carbon dioxide emissions from fossil fuels to peak by about 2030 and then begin to decline. Exxon's report came just after the United Nations Intergovernmental Panel on Climate Change warned that the impacts of global warming are likely to be "severe, pervasive and irreversible". Can US gas exports change the global market?